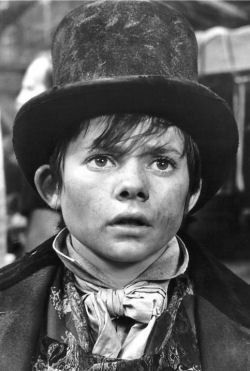 The BBC are reporting that Jack Wild, Londonist's favourite Artful Dodger, has died. Wild was nominated for an Oscar when he was just 16 for his role in the movie. He suffered from mouth cancer and had his voice box and tongue removed. Wild's agent Alex Jay said the actor "died peacefully at midnight last night after a long battle with oral cancer". The last thing we remember seeing him in was Kevin Costner's Prince of Thieves. He played Much the Miller's Son. His most famous role was of course in the 1968 musical version of 'Oliver Twist', in which he starred opposite Oliver Reed and Ron Moody. His scenes with Moody's Fagin are some of the most memorable in the classic movie. His career never again got near the dizzy heights of being nominated for an Oscar for Best Supporting Actor, but he did release three albums in the seventies. The Morrissey song 'Little Man, What Now' is believed to be about him. The cast (of Oliver!) included 84 boys between 8 and 15 years of age, and one member of Parliament suggested they were being exploited just as the depicted orphans had been. The filmmakers replied that they needed protection more than the boys did, due to the rowdy nature of the production during the summer.